Thank you for contacting us. Please ensure you have provided your telephone number for us to validate your request. Verandah House is a comfortable guest house which is a Grade II listed building. The house can be entered by an entrance lobby with one step down into reception area. • Bookings can be made either by phone, fax or email from our website. • The website clearly shows details of the property and the surrounding area and directions on how to arrive. • There is a car park to the rear of the property for up to 6 cars. Guests that have walking difficulties can be dropped at the front door to download their cases. The car can then be driven to the car park (either by the proprietors) or by their driver. • Step down into the reception area of 13 cm. 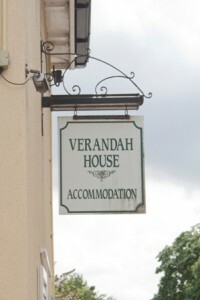 • Not Available as it is only a Bed and Breakfast facility. • Two steps into Dinning room of 17 and 19 cms high. • Two steps up to the ground floor room of 17 and 19 cms. However, access to the bedroom can be made via the garden side entrance to avoid any steps. Also access to the dining room can be made via the garden door and through the verandah and conservatory. • Side gate into the garden from the street.